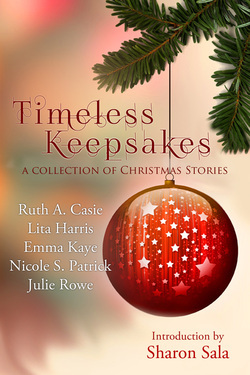 A widow's everlasting love is transported by the memories of the holiday season. She doesn't belong in his time and he doesn't belong back home. Could they belong to each other? “I hate Secret Santa,” Kenzie Bowman muttered to herself. She crossed her arms over her chest and leaned against the wall, as far away from the crowded hospital’s emergency department lunch room table as possible. The table was covered in wrapped boxes and gift bags. A bevy of nurses rummaged through them looking for their name on a tag, squeals of glee and laughter filling the remaining space in the room. Anyone walking by would think it was Black Friday. They’d be lucky if they didn’t end up treating one of their own for a bloody nose. She used to love Christmas. The decorations, buying just the right gift for a friend, singing carols, and spending time with the people she loved. Until her twin brother, Kennon, was killed on Christmas Day. Now, she just wanted the entire event to be over. She never wanted to see another Christmas tree, hear another Christmas song, or taste eggnog ever again. Her friend Amy surfaced from the circling sharks with a gift in each hand. “I found yours, Kenzie,” she said with Christmas cheer that darn near dripped sugar. Amy bounced up to Kenzie and thrust the gift into her hands, then proceeded to rip the paper off her own. “You sound like a computer when you talk that way,” Amy said, enunciating each word individually.